Mrs. Chauff has a long history with Visitation Catholic School and Church. She became a parishioner of Visitation Church when she was just 6 years old, confirmed and married at Visitation. 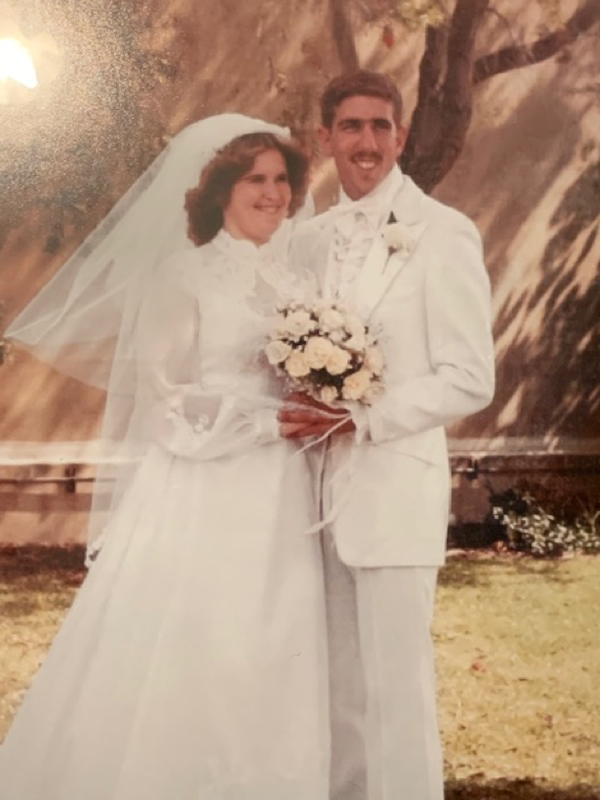 Below is a photo from the wedding from 1980! Mrs. Chauff's oldest daughter was in the very first Kindergarten class at Visitation in 1988! Both of her daughters graduated and received all their sacraments at Visitation. As a parent, Mrs. Chauff felt the strong passion for school involvement by becoming a Room Parent Coordinator, Drill Team Moderator, and volunteering throughout her daughters years. Mrs. Chauff began teaching pre-school in 1979 and worked for many years with this age group. Before coming to Visitation as a substitute teacher in 1992, Mrs. Chauff was instrumental in the opening of a Carousel Preschool located in El Segundo where she became the School Director. Following her role as a substitute at Visitation, Mrs. Chauff eventually became a part of the full-time staff - teaching in Junior Kindergarten, Kindergarten and 1st Grade. Aside from her role as a teacher, she was involved with the Daycare Program from 1991 to 2018. Over the years she was appointed the Daycare Director for 25 years. In addition to her years at Day Care, she worked with Student Council as Moderator for 20 years. Making the connection between the two areas of greatest joy in Mrs. Chauff’s life, education and protecting God’s children, she was one of the founding members of Safe Guard the children at Visitation. During her many years of teaching, she has taken on a multitude of continuing education courses and has served in the prestigious role as a mentor teacher for approximately 5 years. In addition to her obvious love of children and teaching, Mrs. Chauff is a true Catholic role model. She has been a Eucharistic Minister since 1998 and became a certified Catechist in 2012. Mrs. Chauff has always enjoyed working with the little ones; she gets much joy from watching their minds at work, all while they are having fun. There is no greater occupation than that of a teacher. To share in their excitement of learning and to see their smiling faces each day is truly one of Mrs. Chauff's greatest joys.